Its been about six months since the Government took over. When the Government was sworn-in, I had written about how very rarely, in this day and age, does a Government get such an overwhelming majority in the Indian Parliament and why this opportunity must not be squandered. Though the Government has done a decent job on a lot of fronts, the danger of not succeeding lies within. We see, with amazing alacrity, every now and then, some Hindutva-obsessed lunatic making a remark or doing something so crazy that the Government has to spend an inordinate amount of time defending this. Let there be no mistake. This Government was not elected on the Hindutva platform. 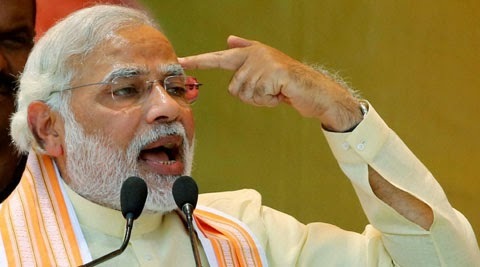 There was nary of mention of religion in Modi's speeches. Yes, there was the odd ridiculous speech here and ludicrous interview there. But, by and large, it would be safe to say that this election was won on the platform of development. There is so much to be done by the Government. Some very good initiatives have been rolled out, some are on the drawing board. India can ill-afford to have the Government's focus shift away from these critical issues. Let us not forget that we may not see a Government with a majority in the near future. Another important aspect is that there was a lot of distrust of Modi among the minorities. That did reduce recently. A large number of Muslims and Christians voted for Modi assuming that he would solve their basic problems. When the demented dudes and dudettes of the Parivar are given a free rein, and some actually encouraged, these minorities would feel let down. They will never vote for Modi again. The task at hand for the Prime Minister is not one that will be accomplished in one term. We need a strong Government for at least two terms to give any positive direction to the country. Without the support of the minorities, I am afraid, such a majority in Parliament would not be possible. Modi is seen as a strong leader. Few doubt his intentions. If he does not act soon enough to control these loose canons and makes sure he takes the entire country with him in the march to development, he would have lost a huge opportunity to make a real difference. He would have only himself to blame for this.